The majestic Valhalla sits proudly amidst expansive manicured gardens and rolling lawns facing the sun and the sea. 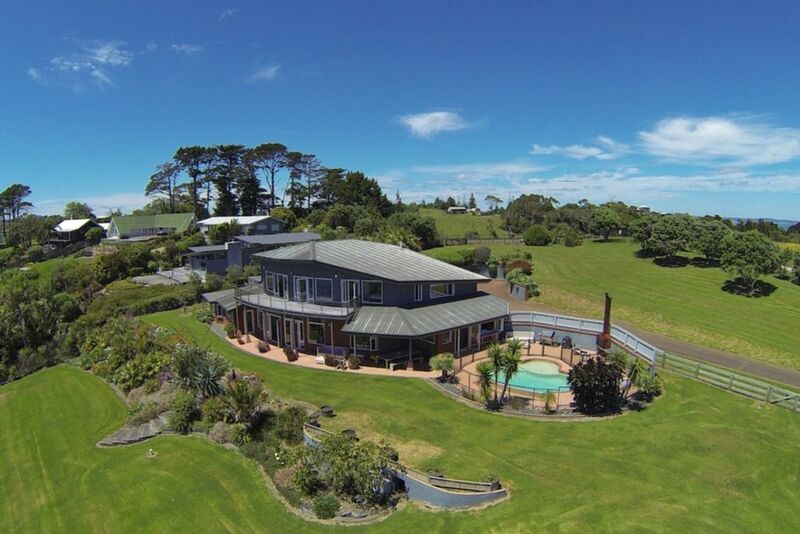 The northern views of the Hauraki Gulf, outer islands and the Coromandel from this grand six bedroom property will take your breath away. Centrally located and convenient to everything Waiheke, Valhalla will comfortably accommodate up to 15 guests over two levels. Valhalla is a delightfully spacious, newly refurbished and fully equipped holiday home. Enjoy all day sun on the deck, laze by the pool, or stroll down to the white sands of Palm Beach. Finish the day with a friendly game of croquet or cricket on the lawn and an evening poolside BBQ with the family. You will be spoiled for choice! Valhalla has been built to take advantage of the views with every room facing the sea. The main kitchen and living area is open plan with french doors opening the house to the lawns, pool and decks. The chef's kitchen offers every amenity including a commercial stove, walk in pantry and wine fridge. The master bedroom with ensuite bath is on the ground level with a further 4 bedrooms and 4 bathrooms on the second level. A private upstairs lounge can be configured as a 7th bedroom if required. Please note: Rates are based on 12 guests. A $50 per person, per night fee applies to extra guests up to 15. This property can accomodate a maximum of 12 adults. Minimum stays - 7 nights between Christmas to mid January, 3 nights remainder of January and all holiday weekends, 2 nights at all other times. Swimming pool, BBQ, plenty of room for lawn games! No complaints. This is a well-situated house that made all attendees very happy. Thanks! Truly amazing views, the website photos do not do it justice. Everything you need on site and room to burn for a large group. Totally recommend this place. Had a brilliant weekend away at Valhalla. Weather was perfect and the house is amazing! Thank you very much.